Sources in the Congress party, however, indicate that final decision on the issue would probably be made closer to the elections as the challenge for the party is to meet Hardik Patel’s reservation demand without antagonising the OBC groups. Ahmedabad: Gujarat Congress leaders are expected to meet party MP and former Law Minister Kapil Sibal in Delhi this evening as party attempts to finalise its position on Patel quota demand ahead of state assembly elections. Campaign committee chairman Siddharth Patel along with Babu Mangukia are scheduled to discuss with Sibal to see how best reservations demands of the Patidar community can be met within the current constitutional framework. Patel is the sitting Congress MLA from Dabhi and son of former state chief minister Chimanbhai Patel. The meeting comes a day after Patidar Anamat Andolan Samiti (PAAS) on Saturday issued a statement claiming Congress in the few days is likely to make its stand clear on providing reservations to Patels in government jobs and educational institutions. A report being prepared by legal experts has been submitted to Congress President Sonia Gandhi, PAAS which is spearheading the Patel quota demand in Gujarat claimed in its statement. “After due diligence, senior lawyer Kapil Sibal has given a report. It is being accessed how reservations demands of those who are out of quota ambit can be met.” Hardik Patel led PAAS said amid ongoing talks with the Congress party on extending support ahead of the upcoming state assembly polls. A delegation of PAAS has already had a round of comprehensive talks with state Congress leaders last month in Gandhinagar. While there is consensus on most of the demands made by the Hardik Patel led group, there is still no clarity on how Patel’s would be accommodated in the existing constitutional framework for OBC reservation. Technically, any inclusion in the state OBC list is vetted by the State Backward Classes Commission. This is done only after it is empirically established that a particular caste or a community is socially and educationally backward. Secondly, extending OBC reservations to Patel’s can disrupt caste-coalition Congress’ is attempting to build for the upcoming polls. About 150 castes in Gujarat are currently in the state OBC list. Together they constitute almost 40% of the state population, the largest voting-block. And inclusion of Patel’s- a relatively affluent community- in the OBC list would effectively reduce quota pie for the existing beneficiaries. 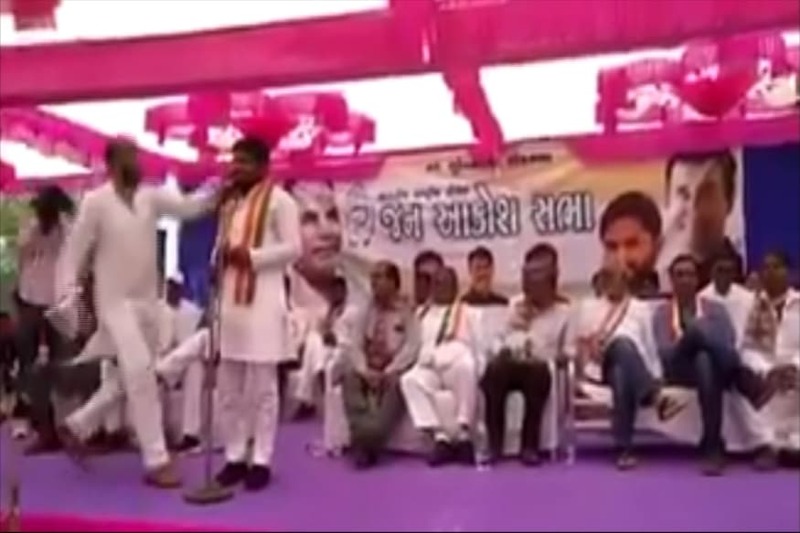 OBC leader Alpesh Thakor at a rally in Ahmedabad last month has already joined the Congress. The challenge for the Congress now to meet Hardik Patel’s reservation demand without antagonising the OBC groups. Similarly, for Patel and his supporters in PAAS, as they attempt to mobilise their community ahead of the elections, it is important to extract a substantive assurance from the Congress on reservations. Sources in the Congress party indicate that final decision on the issue would probably be made closer to the elections. Prime Minister Narendra Modi begins his Gujarat campaign in the second week of November and Congress is closely watching BJP’s next move before committing anything to competing castes groups.